Oracle Corporation is to buy Sun Microsystems for $9.50 a share in a deal valued at approximately $7.4 billion, just a few weeks after a deal by IBM to buy Sun fell apart. It looks like Oracle will pay a premium of $2.81 a share, or 42%, over Sun Micro’s closing price of $6.69 a share on Friday. Oracle said the deal is valued at $5.6 billion excluding cash and debt. 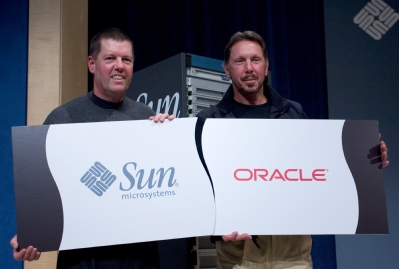 Oracle is calling Sun’s Java “the most important software” it has ever acquired. The deal, which is expected to close in the Summer and was unanimously approved by Sun’s board of directors, has massive implications for the future openness of Java and MySQL. As the NY Times points out, Oracle and Sun are two heavyweights that have been partners for more than 20 years, even if Oracle has been distancing itself a bit from Sun’s server line in favor of competitors like HP and Dell lately because of Sun’s business decline. As a result of this deal, Oracle will now become a behemoth in both the software and the hardware market, and the implications this acquisition will have on the its closest rivals and the market in general will be noticable for years to come. SANTA CLARA, Calif. April 20, 2009 Sun Microsystems (NASDAQ: JAVA) and Oracle Corporation (NASDAQ: ORCL) announced today they have entered into a definitive agreement under which Oracle will acquire Sun common stock for $9.50 per share in cash. The transaction is valued at approximately $7.4 billion, or $5.6 billion net of Sun’s cash and debt. “We expect this acquisition to be accretive to Oracle’s earnings by at least 15 cents on a non-GAAP basis in the first full year after closing. We estimate that the acquired business will contribute over $1.5 billion to Oracle’s non-GAAP operating profit in the first year, increasing to over $2 billion in the second year. This would make the Sun acquisition more profitable in per share contribution in the first year than we had planned for the acquisitions of BEA, PeopleSoft and Siebel combined,” said Oracle President Safra Catz. The Sun Solaris operating system is the leading platform for the Oracle database, Oracle’s largest business, and has been for a long time. With the acquisition of Sun, Oracle can optimize the Oracle database for some of the unique, high-end features of Solaris. Oracle is as committed as ever to Linux and other open platforms and will continue to support and enhance our strong industry partnerships. Sun Microsystems develops the technologies that power the global marketplace. Guided by a singular vision — “The Network is the Computer” — Sun drives network participation through shared innovation, community development and open source leadership. Sun can be found in more than 100 countries and on the Web at http://sun.com.